Sweet and Spicy Shrimp with Rice Noodles…A Hit! As you may know, last week I was very excited about trying a recent Cooking Light Magazine recipe of Spicy Shrimp Noodle Soup. Even though, the ingredients tasted “OK”, the flavors didn’t meld and I was disappointed after all that work in the kitchen. Hence, my hubby’s need to find a similar recipe that included many of the same ingredients but would have that depth of seasoning we was looking for. Success! Cooking Light redeemed themselves with Sweet and Spicy Shrimp with Rice Noodles from the August 2012 issue. Now this recipe lives up to its name “Spicy”, so if you follow the directions as I have listed, be prepared for a wonderful tingly sensation of heat 🙂 My kind of food! However, if you want to have a little less heat, it would be suggested you reduce the amount of hot peppers in the recipe to meet your taste satisfaction. Since this recipe was from a year and 1/2 ago, it did have some reviews that we took under consideration. One being that there wasn’t enough sauce, so when we made it, we doubled the sauce and the recipe below will indicate that. Also, we could not find Thai chile peppers, so we used 2 Serrano peppers since they are not as hot as the Thai chile peppers and it turned out to be a nice substitute. We also seeded the peppers and removed the pulp. The recipe reflects our changes to the original recipe…. Cook noodles according to package directions, omitting salt and fat; drain. Rinse with cold water; drain. Heat a large skillet or wok over medium-high heat. Add oil to pan; swirl to coat. We were looking for a blistered texture to our Serrano peppers so we did this next step a little differently than the original recipe. Add the chile/serrano peppers to the pan and stir-fry for one minute, then press down with the spatula to get the skin of the pepper well-cooked. Add cashews, garlic, ginger, and chile to pan; stir-fry 1 minute or until garlic begins to brown. Remove cashew mixture from pan with a slotted spoon, and set aside. Increase heat to high. 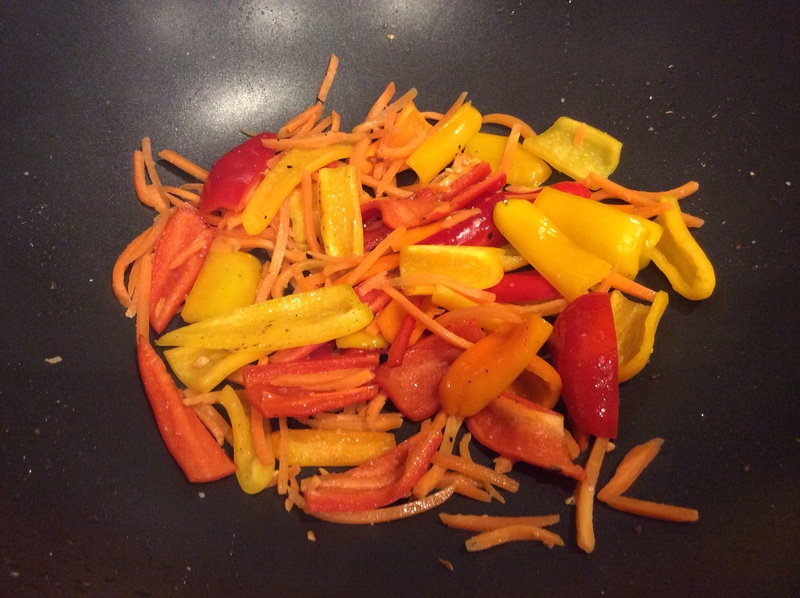 Add sweet peppers, carrot, and salt to pan; stir-fry 2 minutes. All ingredients are in and the dish is starting to come together! Plate and serve with some steamed dumplings and you have a delicious Thai meal at home! Everyone will be impressed! Bottom Line: We LOVED this! It was the perfect combination of shrimp, vegetable, noodles, and sauce. The flavors were bold and fresh; a definite keeper! I have a little left so today I’m going to take a small whole wheat tortilla and put these delightful leftovers in a wrap for lunch…YUMMY! ← Jeff makes me a nice steak dinner using my blog recipe! Ahhhmazing! I thought it would be complicated with all the ingredients, but it wasn’t! I stuck to all of Frankie’s directions- ecen used a slotted spoon! Delicious- will make again! Thank you sooo much, Susan!